Phil Allen, Executive VP of Marketing and Scott Rupiper, Midwest Regional Sales Mgr., stand in front of their New Way®/K-PAC booth at Chicago's Residential Recycling Conference. New Way® is a leader in recycling, providing environmentally friendly refuse trucks for customers in service around the world. So it comes as no surprise that the truck-manufacturing company from Scranton, Iowa, recently showcased at the Residential Recycling Conference in Chicago. New Way® and Scranton Manufacturing, its parent company, were one of nearly 50 exhibitors to display at the two-day March conference. As a waste-truck manufacturer, New Way® has been focused for nearly 40 years on providing distributors — and therefore businesses — trucks that can efficiently and effectively collect, sort, and process waste and recycling material in an eco-friendly manner. As a result of New Way®’s dedication to the environment and leadership in the waste industry, CEO John H. McLaughlin was inducted into the coveted Hall of Fame of the Environmental Industry Association last year. The first-annual Residential Recycling Conference, a national business and technology event, brought together waste haulers, recycling equipment manufacturers, educators, and lawmakers, among others. The conference, organized by Waste & Recycling News, featured recycling-related presentations and networking opportunities for the participants. 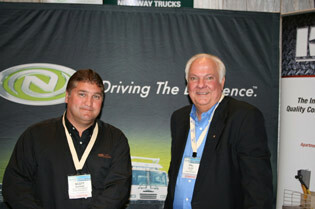 New Way® is already registered as a participant in the 2011 Residential Recycling Conference.